Under secret orders from the President, U.S. Army Major Zeus Murphy sabotages a Chinese invasion fleet on the eve of its assault against Vietnam. But after Murphy and fellow officer Win Christian are trapped behind enemy lines, Christian's erratic behavior gives them away. The pair shoot their way out of a Chinese airport terminal, hijack a bus, then barely escape two truckloads of soldiers before disappearing into the night. Thus starts Zeus Murphy's personal odyssey in the latest installment of the Red Dragon Rising series. Back in America, President Chester Greene fails to convince Congress that the Chinese invasion of Vietnam is the first step in a plan to rule Asia -- and eventually go to war with the U.S. Not even the Pentagon will support the President; top-ranking officers do everything they can to sabotage his orders. After Zeus and Christian dodge a Chinese armored division and return to Vietnam, Zeus proposes a plan to blunt the tank attack. His commanding officer orders him to stand down. Zeus disobeys in an effort to help the Vietnamese woman he's fallen in love with. 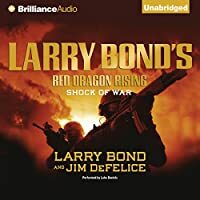 Win Christian goes with him to prove he's not a coward...within hours, both men are alone with a company of Vietnamese soldiers on the border, staring down the barrels of Chinese main battle tanks as they drive on Haiphong, starting a countdown to all-out war with the West.